There are currently 125,611 users on this website. The example today is for a coin being sold as if it is genuine when it is a well known forgery from the 1960s. For anyone who is looking closely at the design it is easy to tell the coin is not genuine, but if you believe it is a Contemporary Circulating Counterfeit you are incorrect. It is difficult to tell by looking at this photo because the coin has been artificially aged and toned, however, I have encountered near MS examples where the modern origin is quite apparent. This fake was very common at one time and still appears fairly often on eBay and in other venues. 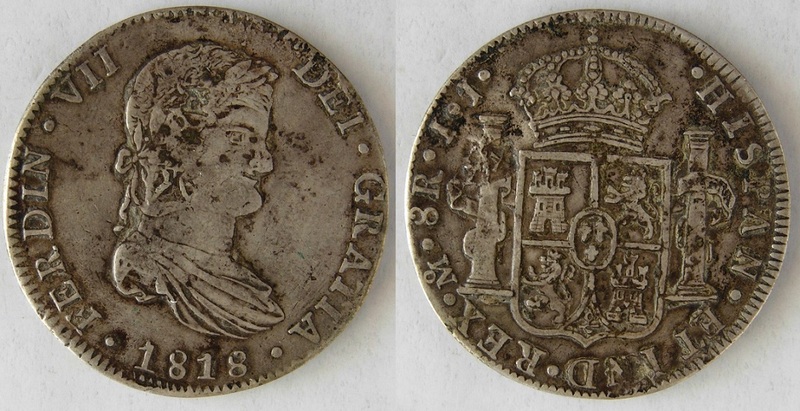 One problem is that the coin is listed in Calbeto's 1970 reference as # 1903 in the counterfeit section. The "counterfeits" listed in Calbeto were not classified as CCC versus NF so he likely did not care about making that distinction. However, today, the distinction is becoming more important and many collectors like myself who view Numismatic forgeries as nearly worthless frauds. In my book it is listed as a Numismatic Forgery on page 158. Is the profile cartoon-ish or is it because engravers had no really good idea of the true shape? I mean, is it an imitation of a genuine poor profiles found on some legitimate coins, or is it a composition that the fakers got wrong? I did note that the seller did not seem to indicate actual weight. Do you think it's just a come-on sale hoping for some poor schmuck to pay up? Have a copy of this one in my collection and thought it was contemporary. I guess I'll be moving it over to the numismatic forgery album. I've read Bob's book through at least 3 times and still missed this one. Thanks for the info Bob. A fake fake, complete with fake scratches and adjustment marks. That takes brass. What's the weight and metal? The seller claims it is silver but does not post the actual weight and so far has not returned an inquiry. My copy weighs 25.6 grams and has a specific gravity of 8.5. I can't take a picture as my camera has stopped working. However it is pitted and scratched and has approximately the same wear as the forgery pictured. Albert The profile is a very poor imitation of the genuine portrait. It was engraved into the die by someone with a rather high skill level but he apparently lacked an artistic eye. I put it in a "utilitarian" class of engraving, someone with limited artistic flair. 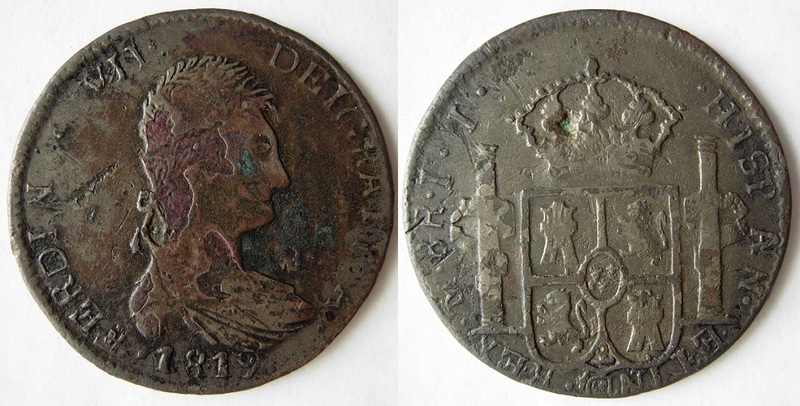 This 1816 Mo is less cartoonish than some examples in my book. Here is one of my favorites from 1818. 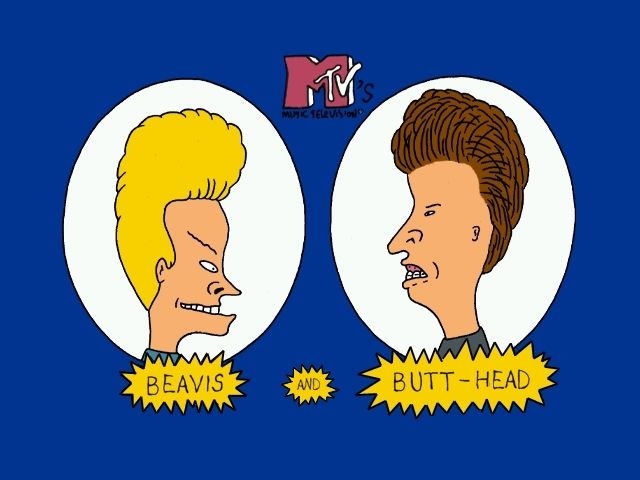 All three I refer to as cartoonish because they remind me somewhat of the characters Beavis and Butthead that appeared in a cartoon my now grown son loved as a kid. The reason the 1816 Mo often passes as a contemporary counterfeit issue is precisely because it is hand engraved. It is not a transfer image taken from a genuine coin. The same coin was originally proposed for inclusion in my book by three different collectors who believed it was old. So I tested one example of this 1816 with XRF and that was a lab test of limited duration (one minute exposure) due to the cost. However the test did disclose the presence of a modern metallic trace contaminant that was completely unexpected and which in my opinion can not be explained away as anything other than a twentieth century contaminant. This is also the ONLY counterfeit I am presently aware of where an XRF test has indicated this particular element - except for some Modern Chinese forgeries. Now I do not profess to be infallible on the subject and I am always open to scientific arguments that would disprove what I believe. I will next cover the factors that led me to believe this was a Numismatic Forgery and not a Contemporary Circulating Counterfeit. When I first saw the coin in the late 1960s the examples were always high grade, obviously not genuine and they had the look of other tourist fakes that were current at that time. After encountering a few "doctored" examples in the 1990s, I did come to question my initial conclusions. In fact I bought one as contemporary in a batch of counterfeits without recognizing what type it was. The density of the coin falls into the German Silver range. After 1835 even the Chinese Schroffs had begun using SG testing to identify fakes. This coin would be too easily detected as a fake to be successful. The density also means it was made after 1835 and NO EARLIER. 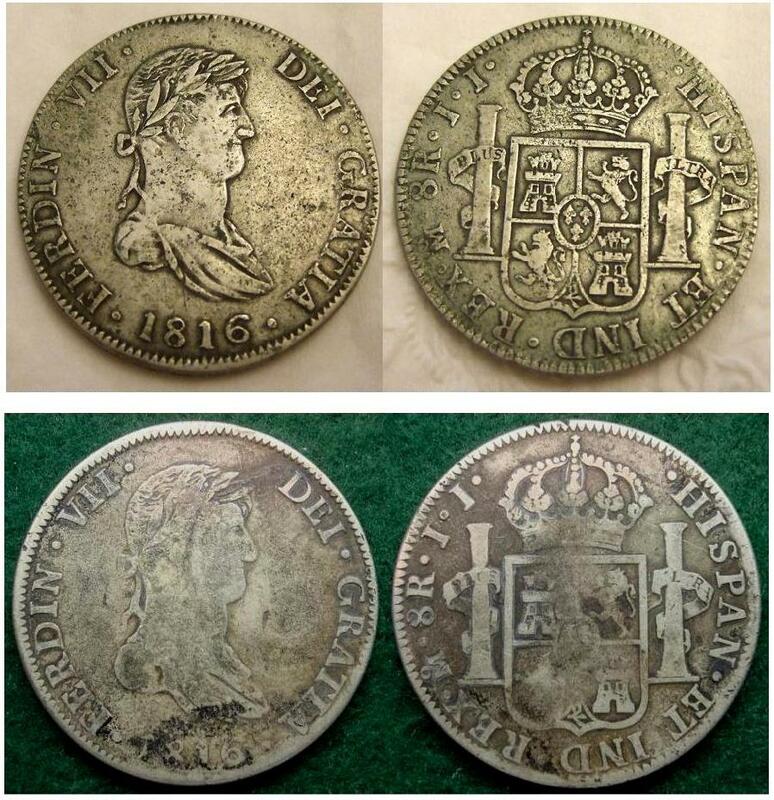 By 1835 Portrait 8 reales were actually scarce in day to day circulation in the US. This would mean that a smart counterfeiter would not target the coin because it might attract attention. The US mint reports for the 1840s show that most colonial portrait 8Rs remaining in circulation in the US were very worn and were reaching the lower limits of acceptable value in circulation (95%) of standard weight. 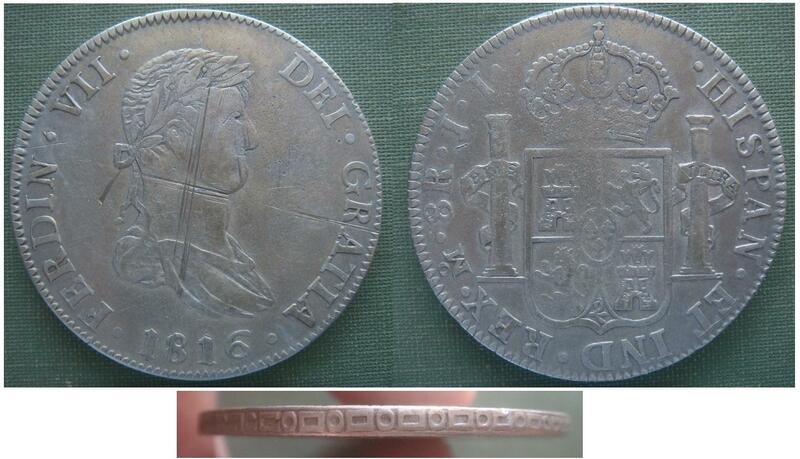 Some examples of this coin weigh as little as 25 grams. That weight would also make these coins suspect from the outset. Next I would point out that while the 1816 Mo is still a very common fake it has to date rarely appeared with what I view as typical period cancellation or test damage. That is odd since high grade counterfeits or even counterfeits with good eye appeal are very scarce. Most common counterfeits will have many more survivors with test cuts than without. This coin never has disfiguring gouges, drill holes or large cut marks. It is simply too nice looking to be as old as it has to be to be contemporary. You must keep in mind the fact that Ferdin VII 8Rs were never popular in China and never commaned more than a 4% premium over silver value. So there was never an incentive to make Ferdin VII 8Rs even for the China trade. I have many coin collecting friends and my buddy said he did get a reply saying the weight is 25.7g and is not a fake. If he bids and wins he will send it to me and I'll calculate SG and provide photos of interest. If he loses then we will have nothing. As a follow-up, my coin buddy says he did bid, but was outbid so he let it go. I guess I won't bother to bid against people that think it is a genuine coin. Bob, I'm curious. What is the suspicious contaminant? It took 2.07 seconds to rattle this change.